On Wednesday afternoon, the NBA announced that it had suspended Sacramento King big man DeMarcus Cousins for one game for striking Dallas Mavericks guard O.J. Mayo in the groin on Monday night. Our Dan Devine covered the incident, which turned into an entirely different kind of story after Mayo said that Cousins has "mental problems." Cousins fired back Wednesday by questioning Mayo's own history, but (for now) Cousins looks like the losing party here. In isolation, the suspension makes sense. Even if Cousins hit Mayo unintentionally, as he claims, the fact is that he made a dangerous move. Plus, intent can be difficult to ascribe to a non-basketball action. Whether intentionally or not, he hit Mayo in the groin. That's bad, and it usually earns a suspension, particularly for a player of Cousins' less-than-stellar reputation. The problem with this suspension is that the severity makes little sense in the context of other NBA decisions, particularly in the case of Cousins. Roughly a month ago, Cousins was suspended two games for confronting and instigating an "animated conversation" with San Antonio Spurs TV commentator (and former player) Sean Elliott. If we take the suspensions at face value, then the Mayo punch was believed to have been less severe than an argument that resulted in no physical violence or much negative attention beyond the suspension itself. The league's rationale for the difference in severity is opaque and confusing. Unfortunately, that apparent lack of rationality has become standard practice in NBA suspensions this season. Toronto Raptors forward Amir Johnson got one game for throwing his mouthpiece at a referee, which is about as great a display of a lack of respect for the rules as a player can show on the court. Boston Celtics guard Rajon Rondo sat out two games for turning a scuffle between Kevin Garnett and Kris Humphries into something closer to a fight. 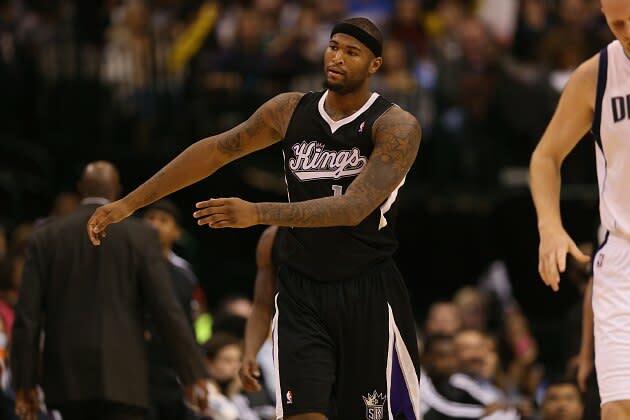 Kings rookie Thomas Robinson was issued the same punishment for violently elbowing a player in the throat. On their own, each of these suspensions makes some sense despite our ability to quibble with the decisions (although I still don't really understand the Cousins/Elliott incident). But an effort to police an organization — and that's what suspensions are, even if they don't carry the weight of the law — has to abide by internal logic. As it currently stands, the league has equated confronting an announcer in a nonviolent manner with elbowing someone in the head, which has also been equated with escalating a fight. And they're all somehow worse than throwing something meant to protect the mouth at a person tasked with upholding the on-court rules and regulations of the league. With increasing regularity, the NBA's suspensions appear motivated by factors specific to each situation rather than the punishable actions themselves: Rondo likely earned two games because he's a marketable star, Johnson is a role player more likely to register as a mere blip on the national news radar, etc. Different players seem to be governed by different rules. Ostensibly, suspensions and related punishments exist to discourage certain kinds of behavior and keep players from acting improperly. As things currently stand, the punishments seem like randomly selected reactions to unwelcome actions rather than logical statements of the NBA's values. All we're really learning is that the league office doesn't like it when players to do bad things. It's governance by fiat, not a foundation for a stronger working relationship between the league and its players.